57,705 Queenslanders served their country in the First World War from 1914 to 1918. These brave men and women, some of whom were just teenagers, wrote home about their experiences. 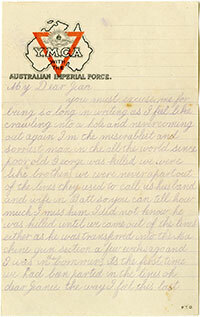 A heartfelt letter home from a weary soldier in a muddy trench in Flanders. A hastily scrawled note from an exhausted nurse on Lemnos to her mother in Ballarat. These fragments of lives in turmoil can tell us more about the First World War than any history book. They are our direct link to the Anzac experience, providing raw observations of foreign lands and the struggle and courage of those who served. During the centenary of the First World War there are many ways to remember the 57,705 Queenslanders who served their country from 1914 to 1918. Explore what's on and find events you can attend. Watch as current servicemen and women read letters from the First World War. 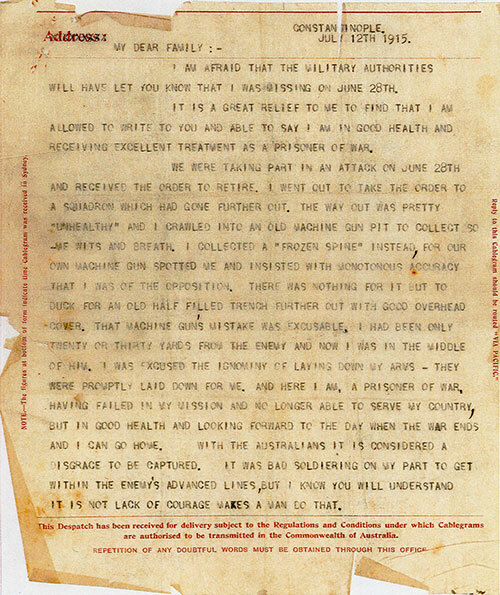 Inspired by these letters, we hope to encourage people of all ages to learn about Queensland’s role in the First World War and its impact on our nation. 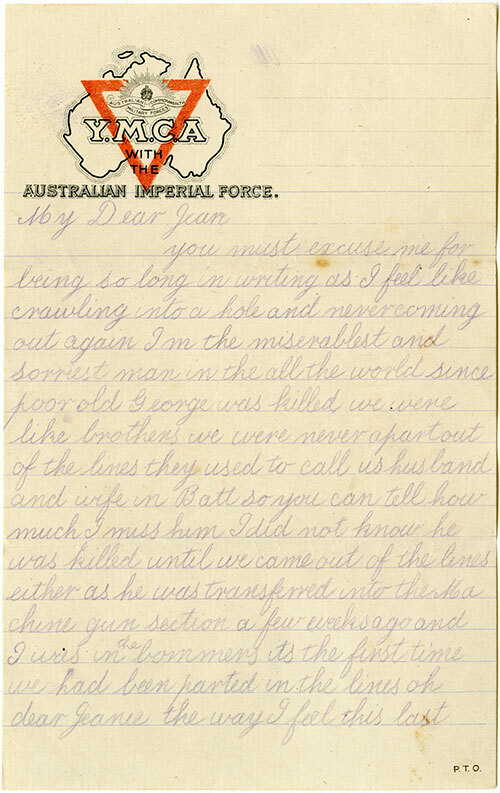 Maruice Delpratt's letter was written during his time as a prisoner of war after being captured during an attack on 28 July 1915. 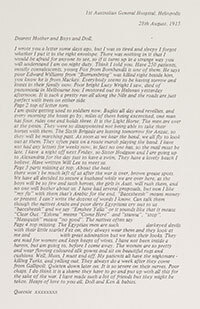 Flight Lieutenant Scott Hamill, Royal Australian Air Force, RAAF Base Amberley, reads an excerpt from Maurice's letter. Maurice Delpratt was born in 1888 in Tamborine; he attended the Southport School where he became a teacher and housemaster. Maurice was working as a station overseer in Longreach when the First World War began in 1914. He joined the 5th Light Horse Regiment and left for the war in December 1914. In June 1915, Sergeant Maurice Delpratt was captured behind enemy lines in Turkey and became a prisoner of war. For three and a half years Maurice and his fellow prisoners worked on the construction of the Baghdad Railway. He was released once the war ended in 1918 and returned to Australia in July 1919. Maurice went on to marry and raise a family. 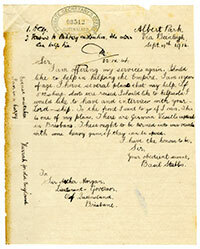 He passed away in Warwick in 1957.
read a transcript of Maurice Delpratt's letter (PDF, 107KB). Edith Florence Avenell was known by her nickname, ‘Queenie’. In her letter, she writes home to her family about her experiences as a nurse based in Heliopolis. Leading Seaman Christie Piper, Royal Australian Navy, Bulimba Barracks (Brisbane), reads an excerpt from Queenie's letter. Born in Gympie in 1890, Florence Avenell was known by her nickname, ‘Queenie’. Queenie was a very senior and experienced nurse—in 1913 she was a District Hospital Nurse in Mackay and Bowen and, two years later, became the youngest hospital matron in Queensland at the age of just 25. The day after the Anzacs landed at Gallipoli, Queenie enlisted in the Australian Army Nursing Service. Throughout the war, Queenie dedicated herself to nursing soldiers in Egypt, France, England and Australia. In 1919 she married Dr. Harvey Sylvester Walsh. At the age of 46, Queenie passed away at her home in Red Hill. 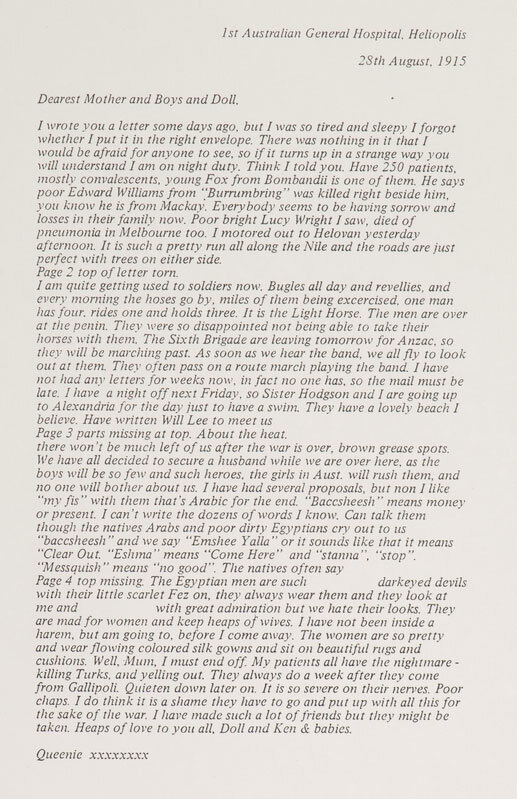 read a transcript of Queenie Avenell's letter (PDF, 61KB). 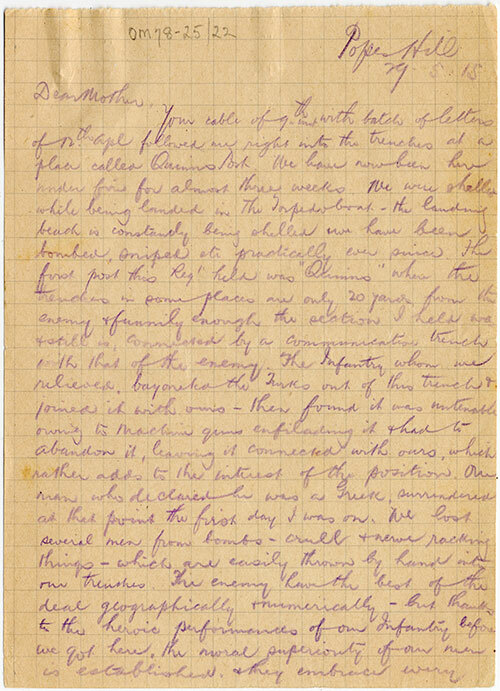 Written in May 1915, George Herbert Bourne's letter to his mother speaks about his time in the trenches at Quinn's Post and the morale of the Australian soldiers. Major Scott Calvert, Australian Army, Lavarack Barracks (Townsville), reads an excerpt from George's letter. When the First World War began, George Herbert Bourne, aged 33, had already served for eight years in the Queensland Mounted Infantry. When he enlisted in August 1914, George was appointed Major in command of B Squadron, 2nd Light Horse Regiment. His squadron was deployed to Gallipoli in May 1915 and George was evacuated due to illness in September 1915. When George returned, his unit was involved in campaigns at Romani, Rafa and Gaza. His contribution to the Battle of Romani was recognised with a Distinguished Service Order. After the war George maintained a connection to the Australian army, commanding several reserve regiments. He also published a book, ‘History of the 2nd Light Horse Regiment Australian Imperial Force August 1914–1919’. read a transcript of George Herbert Bourne's letter (PDF, 109KB). 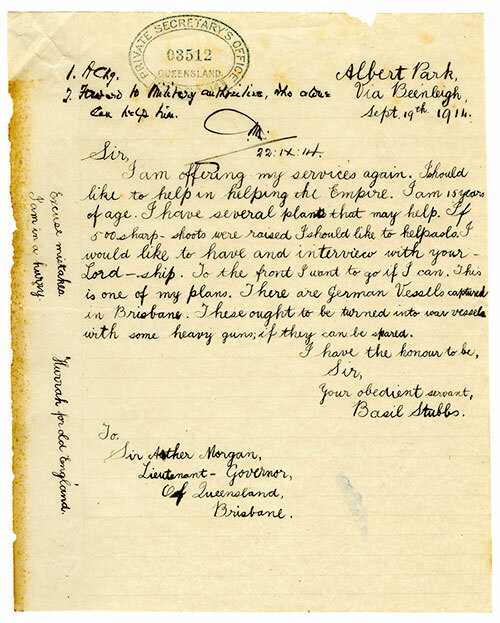 Basil Stubbs's letter to the Lieutenant-Governor of Queensland expresses his desire to help with the war effort. Axel Duffy reads an excerpt from Basil's letter. Basil Stubbs was only 15 years old when the First World War began in 1914. He came from a family of 14 children, and was determined to follow his older brother and join the war effort. Although he was too young to serve his country, Basil wrote to the Lieutenant-Governor of Queensland on two occasions to offer his services and battle strategies. Following the war, Basil worked for his father as a dairy farmer for many years, he married and raised one daughter with his wife. read a transcript of Basil Stubbs's letter (PDF, 31KB). Owen Joseph Donlen was born in Farba, Ireland and raised in Far North Queensland. He enlisted in the army at the age of 24 in October 1916, and left for the war from Sydney in January 1917. Owen received a gunshot wound to his right leg in October 1917 and was hospitalised again in March 1918. While serving on the frontlines, Owen formed a strong friendship with George Samuel Deviney, a young farmer from the Lockyer Valley. Sadly, George died in battle on 5 April 1918; this had a profound effect on Owen. At the end of the war Owen was in Belgium where on 22 December 1918 he fell from a footbridge and drowned in the River Meuse. 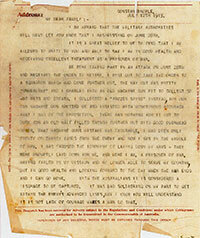 read a transcript of Owen Donlen's letter (PDF, 111KB). * Mr Donlen’s name was spelt incorrectly in a small number of print advertisements that ran on 21 March. This error has since been corrected on all other material. 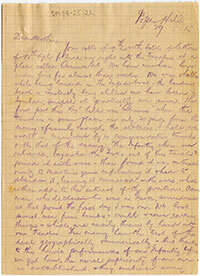 The State Library of Queensland (SLQ) and Queensland State Archives have hundreds of letters available to read online. These letters speak to us vividly from the past, making tangible the wartime experiences of our servicemen and women. There are also opportunities to share stories and donate materials through blogs and collections. SLQ’s Q ANZAC 100: Memories for a New Generation is a four-year program of legacy initiatives to commemorate 100 years since the First World War and Anzac history. Read, contribute and share stories on the SLQ blog, dedicated to First World War memories. SLQ needs First World War materials for their collection. Find out how to donate. Queensland State Archives dedicates a section of its blog to documents and images from the First World War. Stories hosted by the Australian Government Department of Veterans’ Affairs. The Queensland Government wishes to express sincere gratitude and appreciation to the Australian Defence Force for their support and participation as part of this awareness campaign. Having today’s serving men and women read words penned 100 years ago is a powerful insight to these stories, and pays tribute to the original Anzacs. A special thank you to the Australian Defence Force personnel featured in these videos. The Queensland Government would also like to sincerely thank the John Oxley Library, State Library of Queensland and the Queensland State Archives for their insight, research and expertise that greatly assisted with the letters used throughout the campaign.